Whopper's Bunker: The End Of An Era - So Long Bertie! One of the greatest and most memorable periods in Irish political history came to an end on Tuesday as the last of the great Charlie Haughy's cabinet, An Taoiseach Bertie Ahern today tendered his resignation after 11 years in office, which made him one of Europe's longest-serving leaders. 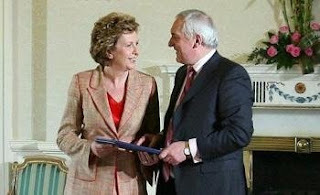 Bertie handed in his seal of office to President McAleese after spending his final day in the post at the site of the historic Battle of the Boyne. He joined outgoing Northern Ireland First Minister Ian Paisley for the joint opening of the iconic Battle of the Boyne site in Co. Louth. The site has been developed by Bertie's government as a reconciliation project, helping to forge a friendship between Bertie and Paisley and thaw relations between unionists and nationalists on the island. Paisley, who is also stepping down later this month after decades at the turbulent frontline of Northern Irish politics said he believed Bertie would make a good Irish president. "I think that probably he will be a candidate for the presidency," he told RTE radio. "After all he has done he deserves to be the president of the country." Bertie was elected Taoiseach in 1997 and won three successive general elections as head of a coalition government overseeing an unprecedented decade-long economic boom, earning long-ailing Ireland the "Celtic Tiger" moniker. Along with then British prime minister Tony Blair, he helped seal the landmark 1998 Good Friday agreement for Northern Ireland. The peace accord steered the province away from decades of violence between Protestants and Catholics and led to the restoration of a power-sharing administration in Belfast one year ago Thursday. 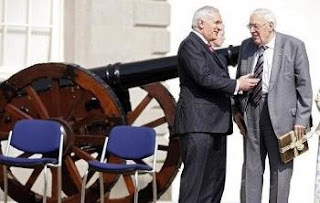 Before handing in his resignation, Ahern said his contribution to a peace deal that largely ended three decades of violence in neighbouring Northern Ireland was his "proudest achievement." "I thank God that we have closed the bloody chapters in our history and opened a new book of reconciliation and renewal," Bertie wrote in The Irish Times newspaper. He also called for the Irish to vote "Yes" to the European Union's key Lisbon Treaty in a June 12 referendum, which will provide the incoming Taoiseach Brian "Biffo" Cowen with his first major test in office. There is also speculation that Bertie might run for the post of EU president -- which would be created by the Lisbon Treaty. He will remain as head of the government formally until later today, Cowen will be elected his successor in the Dail. Bertie is also expected to hand over the Top-Secret Irish section of the UNETIDA "Go-Codes" to Lieutenan Colonel "Whopper" Creedon before Biffo assumes control. What Bertie isn't joining the French Foreign Legion to "Forget" his disgrace?. What is the world coming to? Good thing, you got those codes Lt.Col, I shudder to think what an Offaly man would do, should he get his hands on such power, a massive preemtive miltary strike on North County Dublin, most probably. You've saved the Dubs!, Lt.Col, hows does it make you feel to be a hero to your ancestrial enemies? You misunderstand. I just took the codes so that they could be changed before given to Biffo. They can't use the same codes, but the codes serve the same purpose. Hopefully we'll never have to use them in their intended capacity.